Abbas tries to downplay 'chaos' after official stabbed numerous times outside mosque, blames Hamas of assassination attempt a la 2007 coup. As the "unity partners" of Hamas and Fatah appear to be sliding into war in Gaza, Palestinian Authority (PA) Chairman Mahmoud Abbas on Saturday tried to downplay the stabbing, a day earlier, of a Fatah official. The official accuses Hamas of trying to assassinate him. 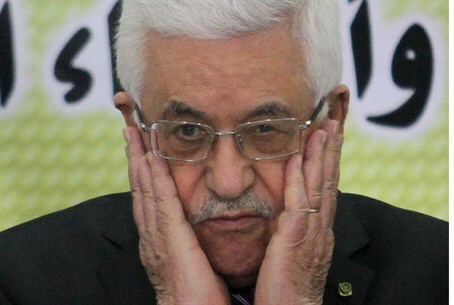 "Some people are trying to create chaos but we will not allow anybody to undermine the security and stability of citizens," Abbas said according to the official PA news agency WAFA. "Any individual who took part in this criminal attack will be subject to punishment by law." Before the statement, Abbas spoke with Fatah official Munir al-Jaghoub, who was stabbed numerous times last Friday after prayers outside a mosque in the town of Beita near Shechem (Nablus) in Samaria, reports the Palestinian Arab Ma'an News Agency. After surgery al-Jaghoub's condition stabilized, and while several suspects have been arrested by PA police the identity of the assailants remains shrouded in mystery. However, al-Jaghoub, who is the public information officer of Fatah's recruitment and organization commission, pointed his finger squarely at Hamas for being behind the attempted assassination. "The attempt to murder me is a reproduction in the West Bank of the bloody coup and the state of chaos in the Gaza Strip in 2007," al-Jaghoub said Saturday to local radio station Mawtiny, referencing the violent Hamas conquest of Gaza from Fatah following an overwhelming Hamas victory in elections. Al-Jaghoub said he had filed a complaint against the attackers, saying "those who stabbed me dozens of times are affiliated to the same groups who have been inciting against Fatah in media and electronic websites for months trying to disfigure the movement's image and its national heritage." He further compared the stabbing to the assassinations of Fatah officials leading up to the 2007 overthrow of Fatah by Hamas in Gaza, hinting that Hamas is attempting a repeat performance. The incident comes after another Fatah official survived an assassination attempt in Gaza just last Monday. Mamoon Sweidan, the Fatah official who serves in the Gaza office on foreign relations, said two masked gunmen in a Subaru conducted a drive-by shooting, targeting him as he was getting into his car outside the al-Saadi building in Gaza City where he lives. The official said two of his guards exchanged fire with the would-be assassins, and that both guards were wounded. The assassination attempt caps off a string of numerous car bombings, in which both Fatah and Hamas officials have been targeted in Gaza with their cars set on fire.